Buddhism shouldn’t be stereotyped as a New Age fad or reduced to a mere technique, says Scott Mitchell. We miss so much by not acknowledging what it really is. 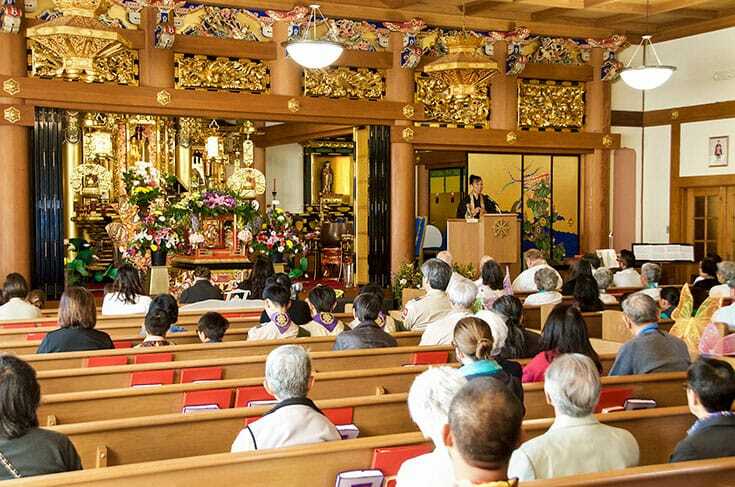 Members commemorate the Buddha’s birthday at the Buddhist Church of San Francisco. Photo by Keith Kojimoto. In the American imagination, Buddhism has long been associated with counterculture drop-outs—Beat generation iconoclasts, Age of Aquarius hippies, woo-woo New Agers. This unfortunate stereotype identifies Western Buddhism with the 1960s-era and later converts who popularized it, and ignores the actual people who brought Buddhism to the West—Asian immigrants. It reinforces the idea that Buddhism is not to be taken seriously. At best, Buddhism is seen as something esoteric and disconnected from the world, and at worst, as something flighty and faddish. On the other side of the coin, proponents of mindfulness meditation and other Buddhist-inspired practices have positioned themselves as level-headed advocates of practices whose benefits, they claim, are proven by science. It’s not hard to imagine that this secular–scientific turn is in part an attempt not to be tarred by the popular stereotype of Buddhism as cultish and downright weird. Both perspectives are incomplete. In reality, Buddhism is a religion, complete with all the aspects and depth that implies and the respect a great world religion deserves. To acknowledge Buddhism as a religion is to appreciate its long history and endless cultural manifestations. Depending on how you slice it, Buddhists account for up to ten percent of the world’s population (and at least one percent of North Americans). 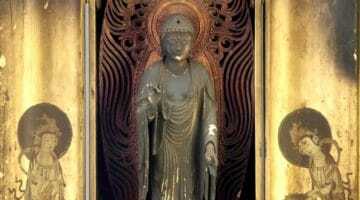 People were practicing Buddhism nearly five hundred years before the birth of Jesus. Before the modern period, Buddhism spread across virtually the entirety of Asia, and in the modern period you can find Buddhism on every continent. 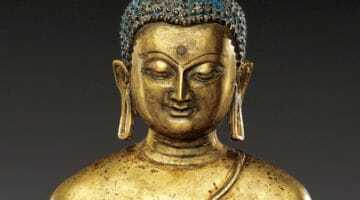 Across all this space and time, Buddhists developed a wealth of approaches, practices, art, and literature in service to the religion’s central claim—that there is suffering and a path toward the alleviation of suffering in nirvana. To reduce all of this history, all of these cultures, all of these perspectives, to a hippy caricature or a single secular-scientific technique is to overlook the fullness of one of humanity’s great religions. To acknowledge Buddhism as a religion is to appreciate its long history and endless cultural manifestations (including our own). “But isn’t Buddhism really a way of life? A philosophy?” some ask. Yes, of course. Like all religions, it has a philosophy. Like all religions, it becomes a way of life when it is practiced. As scholars such as Jay Garfield and Dennis Hirota have long argued, Buddhist philosophers from Nagarjuna to Dignaga, Zhiyi to Fazang, Dogen to Shinran, have been wrestling with philosophical concepts for centuries, long before the likes of Kierkegaard, Heidegger, or Derrida befuddled American liberal arts majors. To say that Buddhism is a religion is to take seriously not only its philosophy and its practices (its “way of life”-ness, if you will) but also its art, its literature and mythology, and its rituals. A purely New Age perspective of Buddhism might take all the mythic aspects of the religion a little too seriously; it might assume that devotional rituals refer to some literal truth or some “unseen” cosmic reality (no doubt related to the dawning of the Age of Aquarius, thus losing half the audience in the room). Perhaps this association motivates some to make the secular turn: to treat Buddhist practices as just that—practices—in service to non-religious ends, such as stress reduction, anxiety reduction, increased focus at work or home, weight loss, and so on. All of this might be of value, but a purely secular–scientific perspective rejects Buddhist literature and mythology as pure fiction, on the assumption that none of it can be “proven”—that none of it can be literally true and therefore should not be believed. This perspective, that religious myths must either be believed literally or rejected, overlooks the function of myths—not as a literal telling of events but as narratives, morality plays, and inspirational stories meant to convey not actual facts but how to live. Don’t get hung up on belief. One doesn’t need to believe in some literal sense that the Buddha taught the dharma to the demon Alavaka in the Alavaka Sutta to be a Buddhist or benefit from the dharma. One doesn’t need to debate the veracity of this story or, like a good academic or philologist, debate its authorship or why it was included in the Pali canon. If you leave all of that aside, you can read the Alavaka Sutta as a story about how to live, how to respond to difficulty, and how to be virtuous, truthful, and giving—whether the story is “true” or not. The ability of a not-true story to be inspirational should not be controversial. I’m quite certain you (or someone you know) has taken inspiration from the phrase “Do or not, there is no try,” despite the fact that no one in their right mind believes that Dagobah is a real planet in a galaxy far, far away. That is how narratives and myths function. Don’t get hung up on belief. 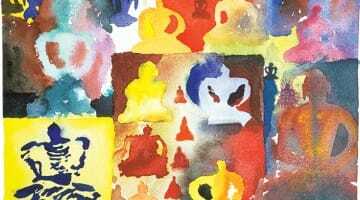 When we reduce the totality of Buddhism down to one thing—whether New Age stereotype or cure-all for the modern world’s ills—we engage in the practice of reductionism. Reductionism flattens difference and complexity. Reductionism always forces us to focus on one thing while overlooking others. The world today is complicated, and simplistic solutions will not cure its complexities. There is no magic pill that will erase suffering for all persons in all places. This is why Buddhists talk about boundless dharma doors and the eighty-four thousand paths to awakening. For Buddhism to be a vigorous voice for positive change in our world, it will need to engage the world from multiple places—from philosophy to politics to art to myth to ritual and, yes, from the Age of Aquarius to secular science. Fortunately, Buddhism as religion is already well equipped for the job. It’s been doing it for over two thousand years, after all. Scott Mitchell is the Rev. Yoshitaka Tamai Professor of Jodo Shinshu Buddhist Studies at the Institute of Buddhist Studies in Berkeley and the author of Buddhism in America: Global Religion, Local Context.